I spent a couple of hours cleaning my office and adjoining sewing room. Considering we are supposed to hit 101 degrees today, somehow having the clutter and dust gone makes the rooms seem cooler. I have started a fun new project, thanks to Rachel over at Life of Riley. She is making a "temperature" quilt. You can get all the details here. She chose 28 fabrics, assigned a range of degrees to each color, and for the next year she will make a quilt recording the highs from each day. So here in Fresno, I thought, well I would need about ten fabrics because we don't have drastic changes during the year. So first of all, I decided to record the highs and lows each day. Then still thinking it would be rather monotonous, Mark suggested I adopt another city. I chose St. Paul, Minnesota, the city where his brother lives. Then I decided to do both Fresno and St. Paul. I think it will be fun to see the contrast between the two cities when it comes to temperatures. I chose the new Grunge fabrics ordered here. They had been calling my name anyway, and beautiful range of warms and cools seemed perfect. I added a few others from my stash, then photographed them in black and white to make sure I had them in the proper "heat/cold" order. I added one additional fabric because Rachel's range only went to 110 degrees for a high (ONLY???). Every summer we usually have a couple of 110+ degree days but hopefully I won't be cutting much from that lower left fabric. And I saw this and desperately want one of these bikes. Mark's brother, the one in St. Paul, could TOTALLY modify a bike for me. "Modifying" is his specialty. Finally, I can't end without something to think about. Mark sent this to me. Hmmmm. Wow, I live in Africa, so I don't even know how cold that really is.... Its winter here now and our day temp. is 23 deg C.
I love everything in this post, The fabrics, the bike and the quote... too funny. Thank you for making me smile! Hopefully you won't be cutting much from the lower right either! Love your temperature edition. It must be an extreme day, your hot high of 101 and our cold start of 41 degrees! You should have fun with a wide range of colors on the hot end with Fresno and the cold end with St. Paul. I can't even remember what it feels like to have a 100-degree day. I miss summer and sunshine so much! I think I need a custom bar like that to fit on my bike. How fun would that be! With the temperatures this week, you may need a lot more of those "hot" ones. I love the quote!! My husband would like that too. I'm not looking forward to the heat today!! Should be 102 down here, and I have to go up to teach my last class in that hairdryer of a temperature. Love that bike--oh yes, we all want one! The bike is awesome! And I'm so excited about your temperature quilt! Yay! I love the idea of a temperature quilt! Brilliant! I look forward to seeing yours come together. I hope you like red and orange. Plus, I can't wait to show that bike to my husband. The temperature quilt sounds like a lot of fun! That's a great stack to play with! We might get to 20' (68' to you) tomorrow - you will never understand how happy that makes us here!! Love those grunge colors. Looking forward to seeing that quilt!! I love the sound of that quilt! I had to convert 110F into Celsius and shrieked when I saw just how hot it was! Blimey, it's a good job I don't live in Fresno, I'd melt (or be such a grumpy cow during the summer that no one would ever talk to me)!! That is one wicked awesome bike!! Cindy your signs always make me laugh and this one really did. Love it and the bike too. 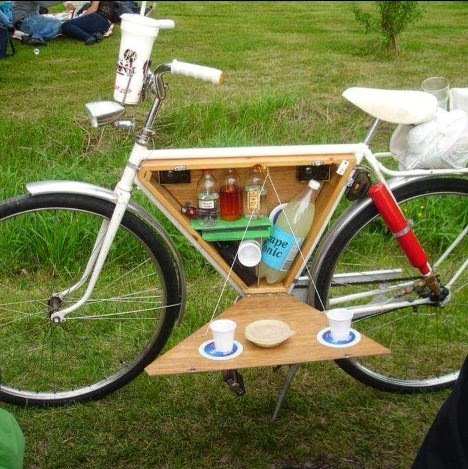 Ha, loving the bike picnic basket!